Roadie tells the story of Jimmy Testagros (Ron Eldard), a longtime roadie for the band Blue Oyster Cult. Living the life touring with the band, Jimmy involves himself with everything that comes with being a roadie. Mainly the shows, the women, and the booze. Everything seems kosher in his life, that is until he’s fired by the band. With nothing else to do, Jimmy returns him to Forest Hills, Queens. Soon he encounters two old high school friends, Nikki (Jill Hennessy) and Randy (Bobby Cannavale), who, much to his dismay, are now married. We soon learn when the three were in high school, Jimmy loved Nikki; however, instead of pursuing her, he chose Blue Oyster Cult. Now Jimmy must decide if he should re-visit a past he once threw away, or try and figure out exactly what life wants from him. What results is a somewhat decently made film about internal struggle. 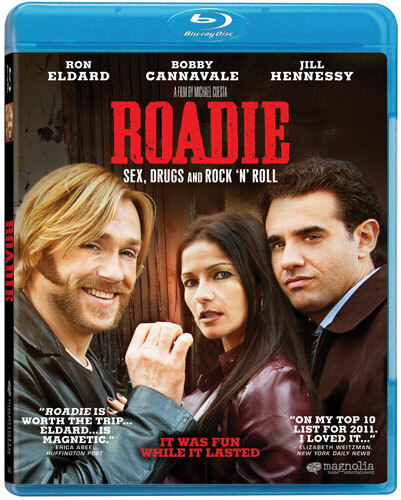 Roadie is the the kind of movie where nothing really ever happens. One may think, after reading the above synopsis, that the film might be this layered drama with a lot that would bring up discussion at the water cooler; however, the issue I found with Roadie is that outside of the first 20-30 minutes, the film never does anything. It’s almost as if the movie was kind of on an autopilot slowly cruising along until it hit the 96 minute mark. This is actually kind of sad in my opinion, as I will easily admit that Eldard’s performance is quite good. We see his struggles with trying to figure out what he wants in life. This kind of theme can easily resonate with anyone, anywhere as we all are trying to understand what life wants from us. It’s just unfortunate that outside of this, the film just isn’t all that good. I’ll definitely say that Eldard’s acting makes the film worth checking out. Just be aware that you may come out feeling as if you didn’t really watch something of real merit. The 1:78:1 framed, AVC MPEG-4 encoded transfer is pretty good. A quick glance over to IMDb doesn’t reveal any sort of technical information about the film, so we can’t really know exactly how the film was shot. With that said, the film features the kind of color palette that has mostly washed out colors. Look at any of the included screen captures and you can easily notice how the colors look kind of faded. There’s a light layer of grain present throughout, but it doesn’t really impact the overall image. All in all, this is a suitable image that should generally please fans of the film. The film’s provided English DTS-HD Master Audio 5.1 track is a tad bit underwhelming. Dialogue is well reproduced throughout via the center channel. I didn’t notice any real hisses, noise, scratches or any other problems. Some of the film’s musical moments do bring a solid sense of atmosphere to the sound mix, but minus that, this is a relatively quiet track. LFE is pretty much absent minus those aforementioned scenes as well are any real rear presence. In all reality, this is the kind of track that suitable supports the film at hand, however, it never really does much more than it needs to. The included supplements are presented in HD. HDNet: A Look At Roadie – This runs 4:33 and essentially is a mini review of the film done by HDNet’s Robert Wilonski. Photo Gallery – A collection of promotional images are shown. On paper, Roadie sounds like it’s going to be this interesting drama about character struggles. Granted, the film does have a bit of this; however, too much of the film felt like it was on autopilot. The same kind of goes for Magnolia’s Blu-ray, with it’s serviceable if nothing spectacular V/A presentation. I do suppose if this film does catch your eye, it’s worth checking out as Ron Eldard does give a fine performance. Outside of that, there really isn’t much to recommend her.